Here are some Easter Party Ideas for younger children in your family or neighborhood. Every year we have two distinct Easter Parties in our neighborhood. 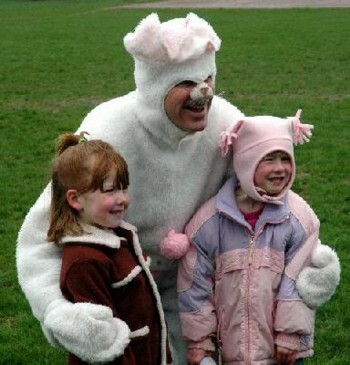 Since my children are of a young age, I always host the Easter party for younger children. I start with my decorations. I have rather large Easter eggs that I place throughout the front yard. These eggs are plastic and can not harm the children in any way if they, in fact, play with them. I even encourage them to do so. In the back yard we spread regular sized plastic Easter eggs throughout the yard for the children to hunt. My husband dresses up as the Easter bunny. Prior to Easter Egg hunting, I read the story of Easter, one that is written in a manner for small children to understand and we do a coloring sheet. Party favors for Easter include crayons, an Easter coloring book, and various Easter Toys. For food we have Rice Crispy treats that I make with food coloring to have in spring colors. We also serve various chocolate Easter bunnies and Easter candy. All the moms take home a Lily as an Easter flower gift. Thanks so much for sharing your Easter party ideas for younger children. They are fairly simple and straightforward which means anyone can do the same with just a little bit of effort. I think it's great that your hubby dresses up to help out. I'm sure the kids must get a big kick out of that! I'm so glad that you share the Easter story with the kids, too. I love treating the children to a fun and exciting event, but I always like to make sure that I explain about the amazing, miraculous, and wonderful event of Jesus dying for our sins and then rising again on "Easter morning." The added touch of the Lily for the Easter flower gift to all the moms is extra nice. I remember going and picking out an Easter Lily for my mom each year when I was a child, too. I haven't thought of that in years! I'm so glad you reminded me. I think this year I'll be sure mom gets an Easter Lily! Thanks again for sharing your fun Easter Party Ideas!